My schedule for track of the week has got a bit off with travel and whatnot so I think I will just wait till next Monday to post the next one and get back on schedule. This post is a little late. I drove over to Idaho yesterday and didn't have the energy to feel like putting together a post when I got here. Setting: I took this picture the other day after the first of the recent snows in our area. This is a front left, the thumb is just visible toward the bottom of the picture. I think this is a juvenile based on the stubbiness of the fingers. Additionally, I suspect they were wearing gloves based both on the details of the track and the conditions where/when the track was located. A friend and I went down to the beach late the other night for one of the big low tides of the season. Fortunately her headlamp was strong, because mine was in real need of a battery change - I kept forgetting I even had it turned on because it didn't make much of a difference unless I was holding something a few inches from my face. We saw quite a bit of cool and pretty things. I may post one or two more later on. A friend suggested this intertidal website for identification purposes. I'm not convinced that what I have pictures of are necessarily the same exact species (and I think some of the species I took pictures of are not on that website), but it seems like a pretty cool resource. One thing I notice about these starfish is that they have a larger white spot just off center. If I had only seen one of these starfish I probably would have assumed that it was just a random spot, but it seems to be on all of this sort of starfish. I wonder what it is? It snowed in Seattle a couple of days ago and the weather has actually been cold enough for it to stay around. So yesterday afternoon I went for a walk to enjoy the snow and see what tracks were out. 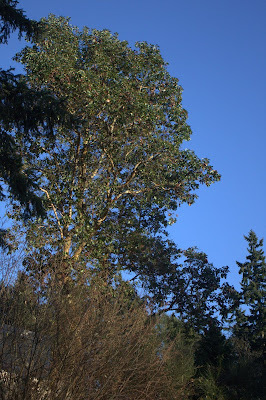 I didn't end up seeing many wild tracks, but as I walked down the road there was a cacophony of birds coming from every pacific madrone (Arbutus menziesii) I passed. I'm not sure if it is because they need extra energy because of the cold, or if the cold made the fruit more delicious, but they were gorging on the small red fruits of the tree. A couple of summers ago along one of western Washington's rivers. This is from a cougar trail. Kitty did a good job of explaining why they fit with being cat tracks and the size and location narrow it down to cougar. For further explanation of feline track characteristics check out the explanation with the bobcat tracks here and the bobcat tracks there. 2. What is the likely gait? Cougars move in walks very commonly. It appears to me that this is a portion of a direct register walking trail. The hind foot landing on top of the front, there doesn't appear to be much disturbance to suggest that it was moving in a faster trotting gait. This was a slightly tricky question as there are actually two feet here. Kitty correctly identified the more prominent track as a hind foot. The fact that it is on top makes that the likely option, it is also a bit narrow which suggest hind rather than front foot for cats. The second toe from the top of the picture seems to be the leading toe which would mean these were on the right side of the body. This is another plant I saw on my trip in the cascades this summer. It was relatively common in the valley just below the big glacier. I like these plants, but I don't see them very much. Seems like it might be only the second or third time I've seen them in the wild. 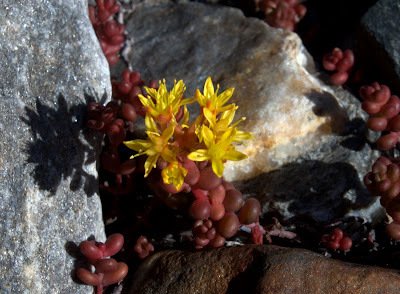 I think this one might be spreading stonecrop (Sedum divergens). Middle fork of the Snoqualmie River, Washington. The end of August, 2007. This is a beaver (Castor canadensis) trail. The large webbed hind feet, I think you can count five toes in some of these hinds, but often with beaver you won't be able to. The much smaller front foot with long fingers that are strongly curved. A rule of thumb that often works reasonably well around here is if it is big, long and weird looking there is a good chance it is a beaver track. Often the front tracks will be wiped out by the hinds and sometimes tail drag is visible, particularly in sandy areas. Nutria have made their way into this region now and have tracks somewhat similar to a beaver. I don't have much experience with their tracks, but from reading the field guide it seems that the toes of their front tracks are straighter than those of a beaver. 2. Which foot is nearest the ruler? The track nearest the ruler is a front right. It is on the right side of the trail and has the toes curved inward. 3. What are you likely to find at either end of the trail? 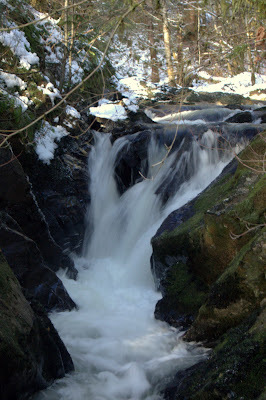 You are likely to find water on at least one end of the trail, sometimes both. There is also a high likelihood that you will find wood that has been chewed on the other end. I went to Northwest Trek a couple of months ago. It is a zoo focused on animals native to the region. 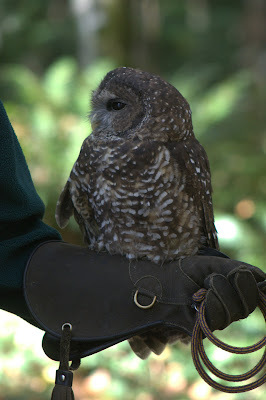 While there I happened by while one of the zoo people was giving a presentation with this spotted owl (Strix occidentalis). According to the presenter owls have small brains but their eyes are proportionally as if we had eyes the size of oranges. These are badger tracks. When I first walked up to them, I thought bobcat because the foot morphology is pretty similar. 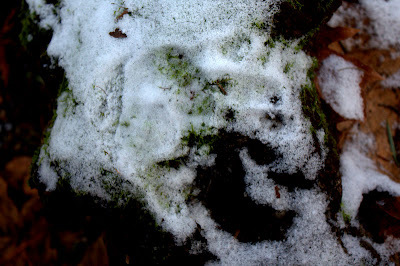 Badgers do have a 5th toe that registers, but often faintly as there is just a faint impression in the front track here. The big give away that it isn't a bobcat though is the claws sticking way out in front. The claws are easy to miss if you tunnel vision in close on the tracks, but once you see them there are very few options of animals around here that have claws that long. And badgers are the only ones that look at all like this. Like most other mammals with long claws, badgers are avid diggers. They are members of the mustelid (weasels, otters, etc.) family though to my mind, they don't seem to fit in it very well. A badger's front tracks are noticeably larger than their hinds. So we have a front track on the right of the photo and a hind to the left. On badger tracks the inner toe is the smallest and does not reliably register. That and the shape of the front claw marks indicate these are the left side of the body.